Use the following instructions to set up a new email account. You can also use them to check the settings on an account you’ve already set up. Remember that the outgoing port should be 587. 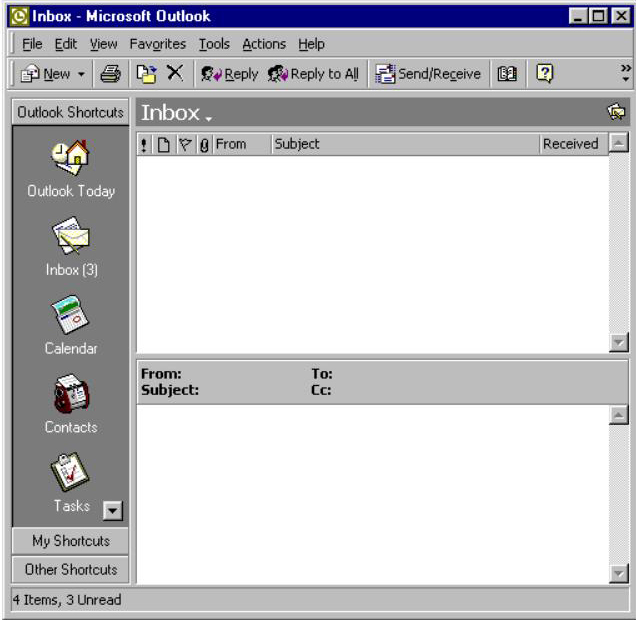 Open Microsoft Outlook 98, you may have an icon on your desktop or you may find it by clicking on the Start button on the bottom left-hand corner and then clicking on Programs. Click on Tools up on the top. Click on Services on the bottom of the drop-down menu. Then click on Internet e-mail from the drop-down menu. Type your first and last name (or however you want to appear) in the name field. Click on the Servers tab up on the top. In the Incoming Mail (POP3) field type mail.forethought.net. In the Outgoing Mail (SMTP) field type mail.forethought.net. Verify that your Outgoing Mail port is 587. In the Account name field type your email address, ex: username@forethought.net. Click on OK on the bottom. You’re finished. To check your email click on Send and Receive up on the top. 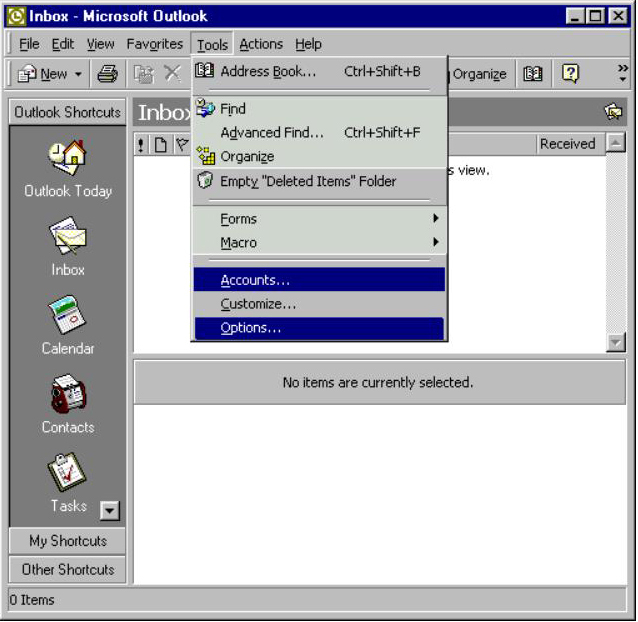 Open Microsoft Outlook 2000 , you may have an icon on your desktop or you may find it by clicking on the Start button on the bottom left-hand corner and then clicking on Programs . Click on Add on the upper-right hand corner. Type your first and last name (or however you want to appear) in the window. Click on Next on the bottom right hand corner. Click on Next on the bottom right-hand corner. Up on the top it should say POP3 for incoming mail server. Type your account name, ex: youremail@forethought.net. Type your password and check the box for remember password. Make sure the button I will establish my internet connection manually is selected. Click on Finish on the bottom. Make sure that Forethought is your default email account. If it isn’t, then click on the Forethought account and then click on Set as Default. Click on Close on the bottom and then you’re finished! To check your email click on Send/Receive up on the top. Open Microsoft Outlook, you may have an icon on your desktop or you may find it by clicking on the Start button on the bottom left-hand corner and then clicking on Programs. Click on Email Accounts on the bottom of the drop-down menu. Click on Add a new e-mail account in the menu and click Next. Click on POP3 and click Next. In User Information fill in your name and email address. In Logon Information where it says User Name fill in your complete email address and in the Password field fill in your password. In Server Information in Incoming mail server (POP3) type mail.forethought.net. Type exactly what you put for incoming mail server also for outgoing mail server, ex: mail.forethought.net. Click on More Settings, then click the Outgoing Server tab. Check the box My outgoing server (SMTP) requires authentication and below that the dot should be in Use same settings as my incoming mail server. Go to Advanced tab and verify that outgoing port is 587. If you are connected to the internet click on Test Account Settings… You should get all green check marks. Click Close, then click Next, then Finish. Click on Account Settings… on the bottom of the drop-down menu. Click on New… and click Next. Click on Microsoft Exchange, POP3, IMAP, or HTTP and click Next. Check Internet E-Mail and click Next. In Server Information leave the Account Type as POP3. in Incoming mail server type mail.forethought.net. Open Microsoft Outlook, you may have an icon on your desktop or you may find it by clicking on the Start button on the bottom left-hand corner and then clicking on Programs. If you have Windows 8 you can go to the Start screen and click on the tile. You may see the Startup Wizard below, if so click next. On the next screen leave the check on Yes, then click Next. If you don’t see the Startup Wizard, click on the File tab, then Add Account. In Server Information leave the Account Type as POP3. in Incoming mail server type mail.forethought.net . Now in the Accounts screen you may need to click the plus sign on the left side and you should see the Add an Account screen. Click on E-mail Account and you should see the following screen. Fill it out using the settings appropriate for your email address. You should change the email address, password, and username to your own but leave the rest of it like the picture. Now click Add Account and you should see another screen which asks about your outgoing server settings. Select the option shown in the following picture and click OK.
Open Windows Mail , you may have an icon on your desktop or you may find it by clicking on the Start button on the bottom left-hand corner and then clicking on E-Mail, or Start, All Programs, Windows Mail. Click on Accounts on the bottom of the drop-down menu. On the next screen click Add. Now select E-mail Account and click Next. On the next two screens enter your name and email address. On the next screen Set up e-mail servers leave the server type as POP3. In the Incoming server field type mail.forethought.net. Type exactly what you put for incoming mail server also for outgoing mail server, for example mail.forethought.net. Make sure to check the box Outgoing server requires authentication and click Next. On the next screen fill in your full email address as the E-mail username and enter your password, and click next. Click Finish to save the account and download your email. Click Close to return to your Inbox and read your email. Open Windows Live Mail, you may have an icon on your desktop or you may find it by clicking on the Start button on the bottom left-hand corner and then clicking on Programs. You may see a Startup Wizard. If you don’t see a Startup Wizard press the “Alt” key on the bottom of your keyboard to display the Menu, then click Tools | Accounts. On the next screen click Add, then select Email Account, and click Next. Then click Next, then Finish. Click on Start, then type Windows Live Mail in the Search field, and hit Enter. You may see the Startup Wizard right away, otherwise click on Accounts, then Email. Enter your email address, password, and Display Name, and click Next. Now enter your mail server names in both the Server address fields. Type mail.forethought.net. 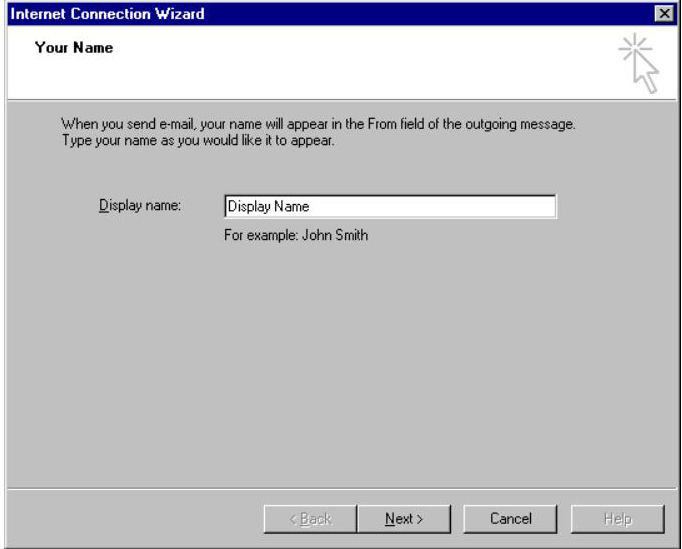 Type your email address in the Logon user name field. Click Next, then Finish. 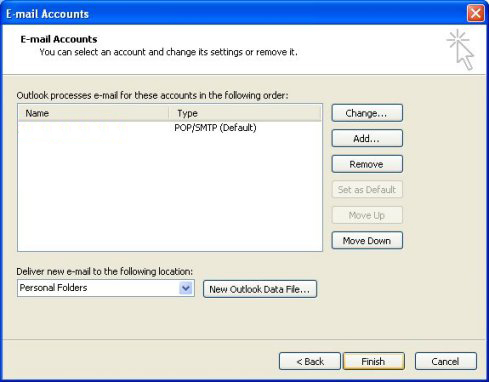 Open Outlook Express , you may have an icon on your desktop or you may find it by clicking on the Start button on the bottom left-hand corner and then clicking on Programs . Then click on Mail from the drop-down menu. Click Properties, then click the Servers tab, then put a check in “My Server requires authentication,” and click OK.
Click on Close on the bottom and then you’re finished! To check your email click on Send/Recv up on the top. Fill in the Incoming Mail Server info like the picture below. Description is optional, it doesn’t need to be filled in. Either select an existing outgoing server, or enter a new one and fill out the info like the picture below. Note: You only need one outgoing server so avoid creating new ones if possible, even if you have several email addresses. 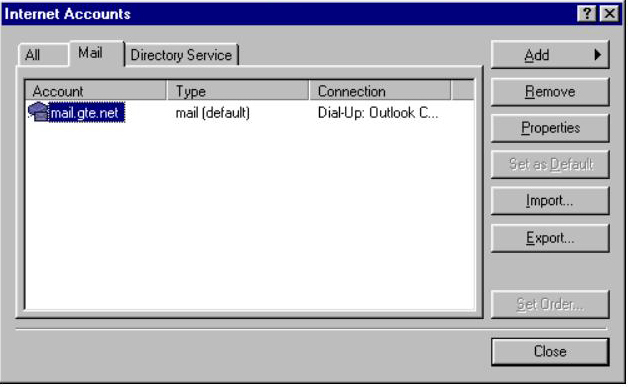 In the Outgoing Mail Server screen, either select an existing outgoing server, or enter a new one and fill out the info like the picture below. Note: You only need one outgoing server so avoid creating new ones if possible, even if you have several email addresses. Description is optional. Click Continue, then select an existing Outgoing Mail Server from the dropdown list if one is available, otherwise type in mail.gobrainstorm.net. Fill out the other information as in the picture below. Description is optional and can be left blank. Click Continue, then review the Account Summary for typos. If needed, click Go Back and make corrections, otherwise click Create. Apple Mail in Leopard has a glitch in that when you go through the Account creation wizard it sets SSL on, without giving the option to uncheck it. This isn’t necessarily bad, but it will give you a warning each time you launch Mail. The glitch is corrected in Leopard and above. You can turn off SSL, once you’ve created the account, by editing the settings. Click Mail | Preferences | Accounts, and you’ll see the screen below. Close and save the changes and you’re done! Choose File > Add Account. Choose your account type, such as POP or IMAP, from the Account Type pop-up menu and enter the information, based on your account type. General information: Enter a description of the account. The description is shown in the mailbox list. If you have multiple accounts, enter something that will help you distinguish this account from others, such as “Tom’s work email.” You must also specify the full name to be displayed in outgoing mail, such as Tom Clark, and the email address to use in the From field when you send messages. Incoming Mail Server: Enter mail.forethought.net. Enter your user name (email address) and password. Outgoing Mail Server: Enter mail.forethought.net. Port 587.